aaahhh ... if I wasn't already here, I'd want to be! I’m back in Merida again, continuing the adventure that is designing a mini-paradise for a Jorge Pardo Sculpture studio project! Those of you who have been reading this blog for a while know how exciting this is for me, and what an amazing learning experience … I’ve been stretching parts of my hort-brain that have only been used to thinking one way – dry dry dry. 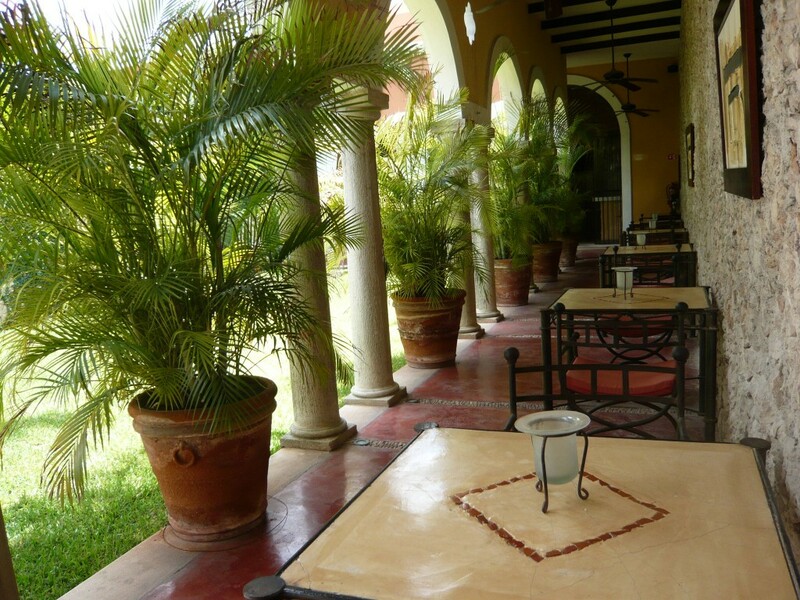 Well, here in the Yucatan, there is ALOT of wet, and that has to be accounted for! What an opportunity! I love being able to responsibly plant the thirsty beauties! So I’ll be running around here for the next week, designing, sourcing plants, redesigning, sourcing more plants, finalizing plans, redesigning … I’ll try and post in a few days, and if I happen to see something utterly FANTASTIC, I might have to post even sooner! Enjoy the beginning of fall, everyone! this is here I sit for breakfast and blogging - charming, no? Perfect, I can totally pretend to be at one of those little tables. Enjoy and I look forward to your updates! This looks lovely – wish I could be there too! Lucky you. 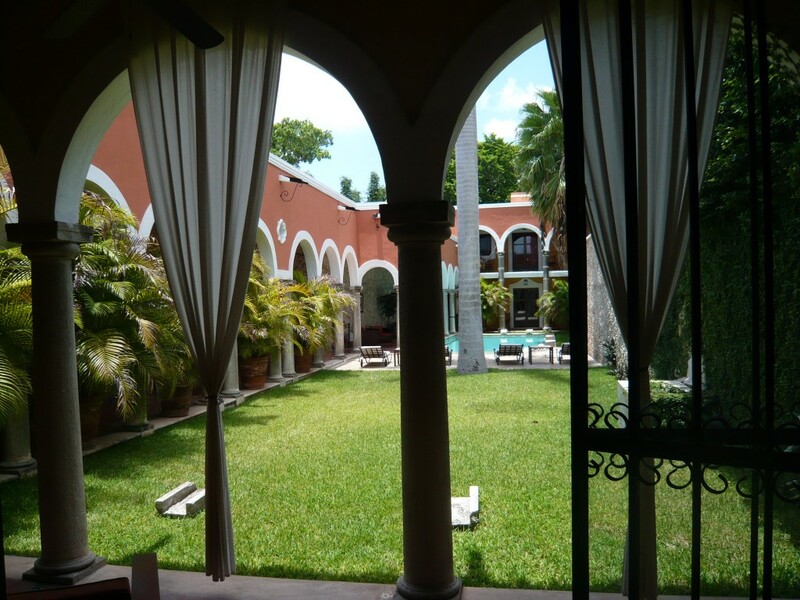 I love those Mexican hotels wit the wonderful courtyards. The weather looks perfect. As if it weren’t enough to stir up all our California envy! Just kidding (sort of). Thanks for sharing your charmed life. I absolutely cannot wait to read about this adventure of yours – just saying the words ‘allowed to plant water thirsty plants’ sounds so…naughty…so….indulgent – you lucky girl, you!! Have an incredible time! Hi all! Mexico is FAB and the project is trucking along swimmingly! Amazingly, the weather is not HELLISHLY hot, either! AND I found some plants that we’d been searching high and low for! RIGHT ON! Welcome back…sounds like this trip will be lots of fun/work. You mentioned orchids in one of your previous posts — not knowing a lot about them. Perhaps one of your local contacts knows Joanne Andrews — she is an expert on Yucatan peninsula orchids (I believe she published a book on them a few years ago) — one of the founders of Pronatura Yucatan, as well. Weather — yes, finally we’re getting a bit more “normal” rain — but, FYI (when thinking about weather/plants) — this year really is significantly drier than normal, probably due to El Nino effect. (for example, most years some parts of the garden have standing water after heavy rains — due to the underlying bedrock –not this year!). We’ve found that dealing with the hot months of the dry season (late March-early June), and the very different conditions of the wet season are a real challenge. Did I mention Selva y Jardin, and it’s owner Silvia in one of my previous comments? DEFINITELY check them out, if you possibly can (they have a web site). Good luck. Have fun. And, of course you are more than welcome to visit our garden (NOT designed, but an acre or so full of trees and foliage plants)…just e-mail. Hey there Ms Germi….I’ve got an Agave ID post up right now (trying to get the name of a few that I inherited) and Pam said YOU are the expert…and that you’ve helped her ID a few. So I know you are SUPER busy but if you have a minute to visit danger garden and share your knowledge I would be most appreciative! Was so happy to be back in my little corner of the world after a fun but exhausting time at the garden writers conference – but now I want to hop right back on a plane and join you! Do you need an assistant? You can boss me around to your heart’s content for a chance to visit such a charming place. Too grand! We all need to go somewhere so exotic and relaxing.